One of the most stressful things about traveling is packing. Even after dozens of trips, packing still stresses me out. What if I pack too much? Or too little? What if my bag goes over the weight limit? Or the size limit?! Even though it can be stressful to pack, I like to look at packing as a challenge. It was always my goal to take as small as bag as possible when I would go to summer camp. And to never pay for a bag when flying. Never. 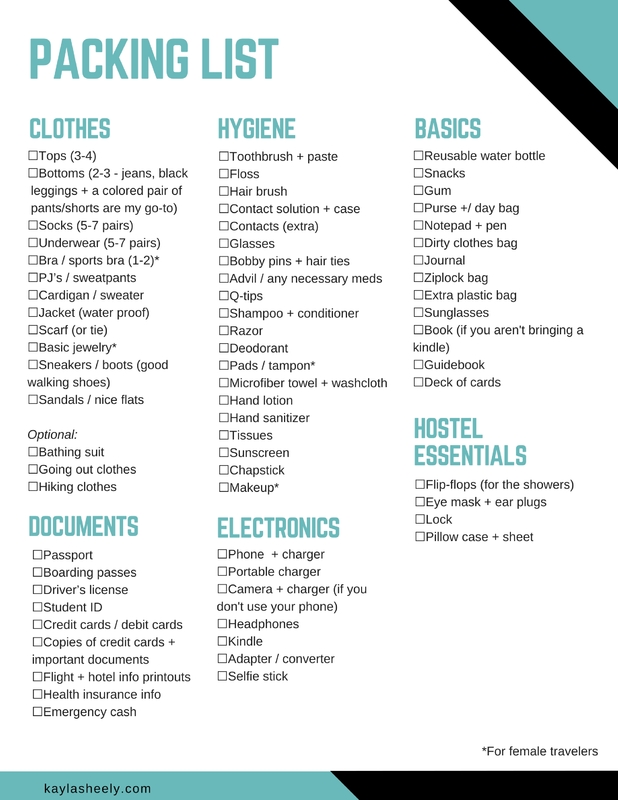 To help minimize my stress and minimize my likelihood of overpacking, I created a template packing list. I adapt the list depending on my specific destination and length of time, but I’ve used the same basic list for a snowboarding trip to Austria, 3 weeks to Thailand and Greece in the summer, and just about every weekend trip in between. Pack versatile clothing. Make sure each item can be worn with at least two other items. Stick to a simple color palette. Don’t bring that one bright, polka dotted shirt that you can only wear with that certain skirt. I usually stick with gray and one (maybe two) accent color. Bring layers. It gives you more outfit options and helps you adjust for unforeseen weather changes. Weigh your bag ahead of time. Many airlines are moving to a weight limit in addition to a size limit. You don’t want to get stuck repacking at the airport! So here is my template! I adapted it for a week long trip, but feel free to use it as a starting point. Depending on where you are going and what time of year you are going, that’s going to change your list as well. And just remember, unless you are going to the jungle in east Asia or exploring the deserts of Africa, you can almost always buy something there if you forget it. Plus, if it’s a piece of clothing, it can double as a souvenir! If you want to print out the list, use this image below. Feel free to add any other specific items in the blank corner. What else is on your packing list? Share in the comments below.